Nearly all amateur astronomers will have a trusted ‘pair of binoculars’ and will often recommend to a beginner that it should be the first instrument to be purchased. This article will endeavor to give some guidance in purchasing binoculars and using them to observe the night sky. The objective lens gathers light and focuses it into an image. The eyepiece is used to magnify the image and direct the light into the eye. Prisms are introduced into prismatic binoculars to enable the body to be physically reduced in length compared to that of a telescope. They also ensure that the image is orientated the right way up and the right way round. Binoculars come in many designs to suit the purpose or requirements of the user. 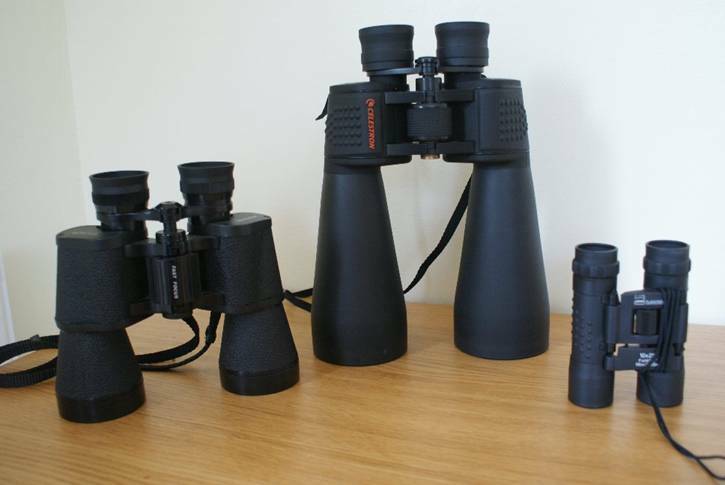 The picture below shows a small selection from the range of binoculars that are available. Binoculars for astronomy use should have an aperture (lens diameter) of at least 50mm (the second number in the descriptions above). The 10 x 25 instrument shown on the right is too small to be much use for astronomy. An aperture of less than 50mm will not gather enough light to give a really good view of the night sky. Binoculars over 50mm do tend to be more expensive and heavier so 50mm is a good size to start with. A magnification of 7x or 8x is the best but up to 10x can be used. The 10x may be difficult to hold steady but if supported on a wall or fence they can be used. So look for a 7 x 50 or 8 x 50. What about cost? Normally the old adage ‘you get what you pay for’ is true. About £35 to £50 will provide a good quality pair but spend as much as you can afford. 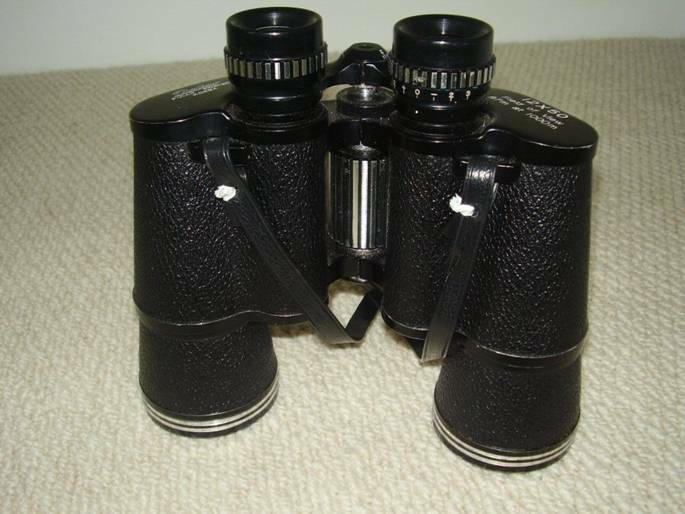 The binoculars shown in the image below are typical of a good but rather aging 10 x 50 instrument. Modern versions would be lighter than this model but the salient features are much the same. The most important feature is of course the optical quality but most modern instruments costing around £50 (before special offer price reduction) are of a reasonable quality. Binoculars with an aperture of less than 50mm are not best suited for astronomy as they cannot capture enough light. Most binoculars have the following features that are designed into the instrument to allow it to be adjusted to suit the user and the purpose of use. The two optical bodies are hinged together to allow them to be adjusted to the positions of the users eyes. By adjusting the angle of the hinge the eyepieces can be moved closer or further apart to achieve the most comfortable position to suit the user’s eyes. 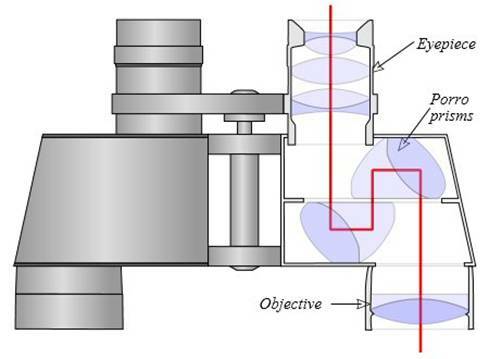 Incorporated into the hinge between the two optical bodies is a focus adjuster often in the form of a rotating barrel. (The central focusing barrel can be clearly seen in the image above.) Rotating the barrel moves the two eyepieces in and out of the bodies. This allows the binocular to be focus on objects at different distances. The right hand eyepiece can be rotated to adjust the focus of each optical body to suit each eye this is called ‘diopter adjustment’. The way to do this is to find a bright star in the binocular (or any distant object can be used during the day). Close the right eye and adjust the focus to suit the left eye using the central focusing barrel. When the sharpest image is achieved (for a star the smallest point of light) open the right eye and close the left. Now adjust the right eyepiece by rotating the dioptre adjuster each way until the sharpest image is achieved. Open both eyes and adjust the focus to suit both eyes using the central focusing barrel to check the quality of the view. Finally binoculars are usually supplied with a strap for hanging the instrument around the neck. It is a very important to leave this on and use it all the time. It saves putting the binocular down when not being used, it may be difficult to find again in the dark. It is also useful for resting the arms after holding them up for some time. It also stops the binocular falling to the ground and being damaged if accidently dropped. Some binoculars may have rubber cups fitted to the eyepieces. These are good because the help by excluding unwanted light from street lights or other sources. Lens covers may also the supplied to prevent dust accumulating on the glass so if supplied they should be fitted when the binocular is not in use. Some cheaper binoculars may display a flare or spikes around the stars but this is not a big problem as long as the effect is not too noticeable. Using binoculars will allow the positions and patterns of stars to be appreciated so some distortion of the star images can be acceptable. So let us move on to using the binoculars for astronomy. The first thing to consider is getting comfortable for observing. All the usual advice given to beginners to astronomy applies. That is: dress to keep warm, make yourself comfortable and avoid lights that shine directly into your face. Little needs to be said about dressing to keep warm except to start observing in warm clothes and don’t wait until cold has set in before dressing up. To be comfortable a reclining garden chair will allow views of the sky overhead to be obtained without a resulting neck ache. It also avoids the feeling of swaying or falling over when looking up into the sky for a while. It is also very comfortable. If a star chart is to be used in conjunction with the binocular a small side table is handy and a not too bright red light should be used to read it. Before starting to use the binocular have a look around the night sky for a few minutes to allow your eyes to adapt to the dark. This will take about ten minutes. Pick out the brightest stars and try to identify them. Familiarise yourself with the positions of those bright stars because they do appear to move from quite noticeably from east to west as Earth rotates. Start at one of the bright stars then try to identify the star patterns on the star chart. This could be a little difficult at first because many more stars will be seen than are shown on the chart. It takes a while to match the slightly brighter ones to the stars shown on the chart. The good thing is binoculars always show the stars the right way up and in the correct orientation. Gradually work outwards from the bright stars and you will soon start to become familiar with that part of the sky. Do stop occasionally and just sweep across the sky and marvel at the thousands of stars. Do the same for other bright stars. The bright stars of the Summer Triangle are a good place to start. When you feel ready to search for something interesting have a look at the chart and find an interesting object. It is useful to make a list of objects before moving out to observe. These objects can be checked in books or on the internet to see if they are within the grasp of binoculars. It is also useful to have an idea what the object you are looking for actually looks like. 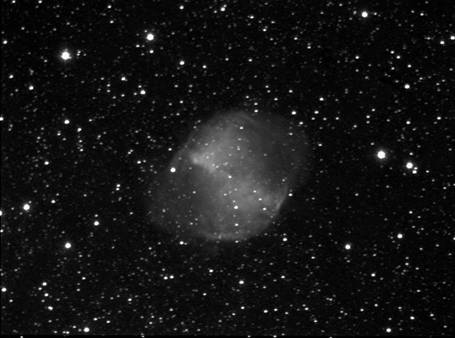 Two objects to start with are M27 the Dumbbell Nebula in Vulpecula and M31 the Great Galaxy in Andromeda. While looking for M27 you will pass through the beautiful star fields of our Milky Way galaxy. A typical 8 x 50 or 10 x 50 binocular will not show detail on any astronomical target other than the Moon. The true purpose of binoculars is to enhance the wide view of the night sky. Stars will appear brighter and many more will be seen than is possible with the unaided eye. So the main aims of using binoculars are: to study the star patterns, seek out the brighter deep sky objects and transient objects like comets. Binoculars larger than 50mm aperture are heavier and generally have a higher magnification (higher than 15x). These two factors make it more difficult to keep a target steady and in clear view. It is therefore necessary to have additional support for the binocular. A simple support can be used by utilising a suitable wall or even a long handled broom. There are custom made support frames available to buy or for manufactured by those with a little DIY knowledge and skill. The device below is a proprietary binocular support mounted to a tripod. It has a counter balance weight and a parallelogram frame that allows the binocular to be raised or lowered while maintaining the same line of sight. 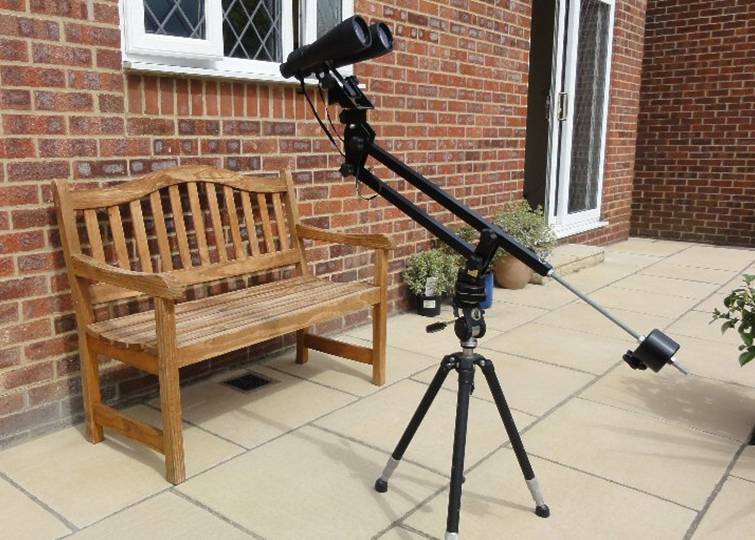 The binocular can be elevated or lowered and the frame can be rotated on the tripod to enable any object to be viewed. Some objects are best seen using binoculars because they appear so large in the sky that a telescope cannot fit the whole object into its field of view. One such object is M45 the Pleiades (Seven Sisters star cluster) in the constellation of Taurus. 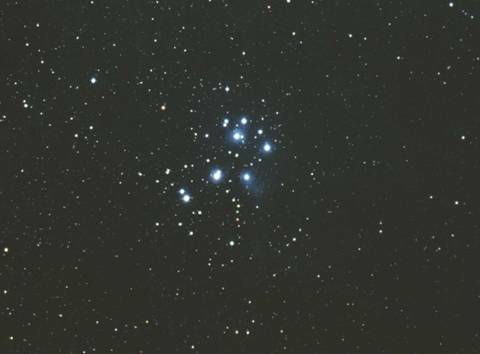 Another cluster best seen using Binoculars is M44 the Beehive Star Custer in the constellation of Cancer.